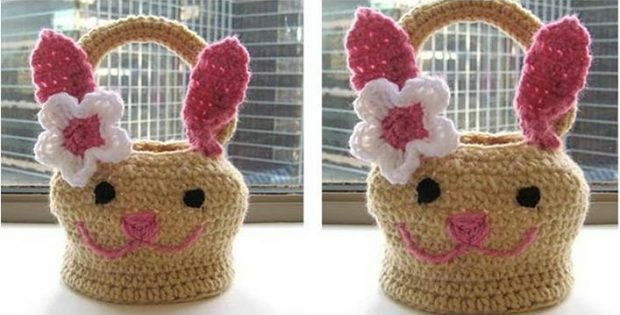 Make this beautiful crocheted Easter bunny basket for the neighborhood kids! The super adorable design will definitely make them smile. In fact, this pattern is ideal for crocheters with intermediate skills. It’s the perfect weekend project! Once finished, the Easter bunny basket should have a height of approximately 4 inches. The base should have a diameter of about 5 inches. In metric measurements, the completed crocheted basket should be about 10 cm tall, and should have a base diameter of around 12.5 cm. This beautiful crochet Easter bunny basket is a design by Shehnaaz (Crochet Dreamz). In fact, you can access the FREE downloadable pattern for this lovely crocheted Easter bunny basket from her website. To access the FREE downloadable pattern for this adorable crocheted Easter bunny basket, please click on this link: Easter Bunny Basket Pattern. Featured image: Crochet Dreamz – thank you!